Engaging education sessions for all disciplines, available in a variety of formats. 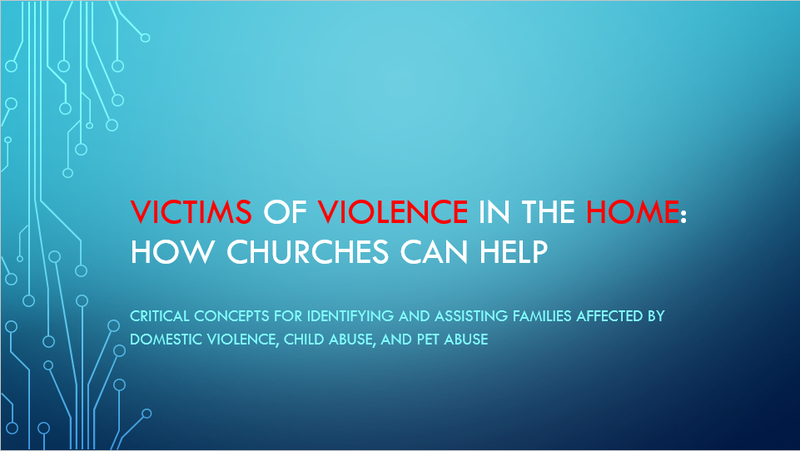 Topics include: Pet Abuse, Child Abuse & Neglect, Intimate Partner Violence, Emotional Maltreatment, How Churches Can Help Victims of Violence, Pregnant Partner Violence, Toxic Stress, Unavailable Parenting, and Developing a Multi-Disciplinary Perspective of Violence in the Home. Caregivers Who Have Been Victimized by Violence in the Home. ​Pet Abuse and It's Interconnectedness with Intimate Partner Violence, and Child Maltreatment. Description: Based on my recent publication in the Journal of Interpersonal Violence which is the first in literature to utilize police officer observations and victims reports from the scene of domestic violence incidents to quantify risk in homes where DV and Pet Abuse co-occur, this workshop will describe the many specific emotional and physical risks of harm for all adults, children, and animals residing in these homes. With nearly 80% of these victims fearing they will eventually be killed by the suspect, these families are likely to require immediate assistance to better ensure a safe and positive outcome. In addition to increased risk for victims, concerns for the safety of first responders at the scene of these incidents will also be addressed. Effective multi-disciplinary strategies for reducing risk and improving outcomes in homes where these forms of violence occur will be described. Developing a Multi-Disciplinary Perspective of Domestic Violence. ​Description: This workshop provides a unique take on domestic violence prevention, identification, and intervention by enabling participants to develop a multi-disciplinary perspective of violence in the home. Results from my national domestic violence survey of victim serving agencies across multiple disciplines will be discussed. Discipline-specific (and shared) barriers to working with victims of domestic violence will be identified (legal, church, law enforcement, education staff, social services, medical, animal, dv shelter). Participants will learn of critical concepts for overcoming these barriers, developing a multi-disciplinary response, and promoting data-driven, effective and efficient community-inclusive methods to better identify and assist these victims of violence. 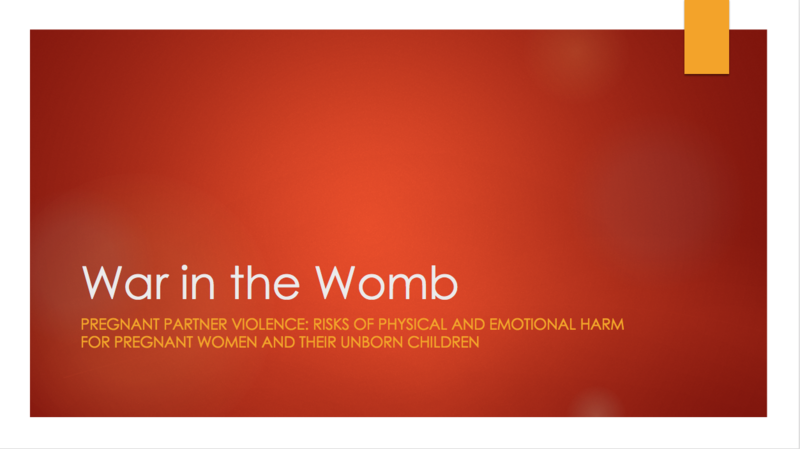 Pregnant Partner Violence: Risks of Physical and Emotional Harm for Mother and Fetus. ​Description: This workshop provides a unique perspective of Pregnant Partner Violence through the utilization of reports and observations from police officers responding to the scene of intimate partner violence incidents involving pregnant victims. Detailed descriptions of victim-suspect demographics, relationship characteristics, environment/household characteristics (including information regarding children witnessing the violence), incident outcomes, and officer observations of suspects and victims on scene are discussed. Topics include: PPV prevalence, PPV incident/environment characteristics, toxic stress, infant and maternal mortality, attachment, emotional maltreatment, child development, urban vs rural risk factors for PPV, and effective PPV prevention, screening, and intervention. How Exposure to Violence in the Community Affects Children. 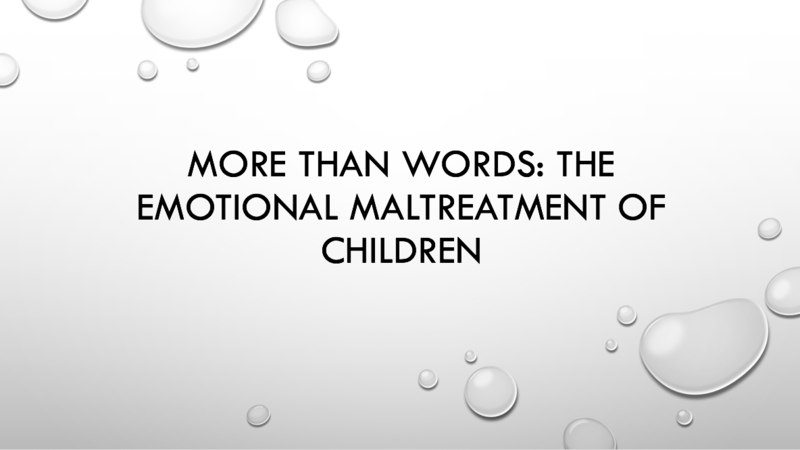 The Emotional Maltreatment of Children. 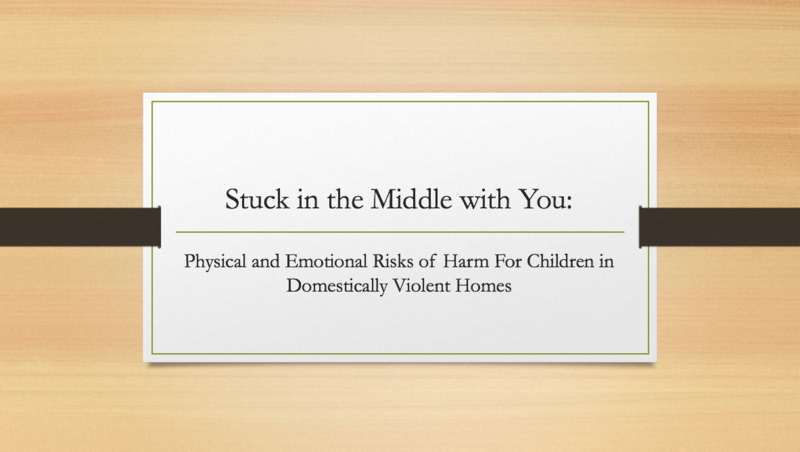 Physical and Emotional Risks of Harm for Children in Domestically Violent Homes. Description: This presentation will discuss the specific threats of physical, psychological, and emotional harm for children living in a home where domestic violence occurs. Common misconceptions will be addressed, including the idea that a child can be too young to be affected by domestic violence, physically observable signs of injury are an appropriate estimator of victimization, and the idea that children who do not actually see a violent act occur are not significantly harmed by it. Other topics to be discussed include: the various forms of child emotional maltreatment, toxic stress, child-caregiver attachment, "unavailable parenting", the effects of witnessing threats or violence against animals living within the home, caregiver risk factors for domestic violence and emotional maltreatment, how to identify victims, and what to do once victims have been identified. Critical Concepts for Identifying and Assisting Families Affected by Violence in the Home.